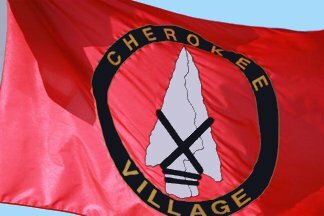 The flag of the City of Cherokee Village is red with city logo on it. Here is description of the flag and logo: "The arrowhead represents the Cherokee Indians, whose tribe originally inhabited this area. The broken line in the arrowhead signifies the Spring River which runs through our city and is a spring fed river. It typifies the natural beauty of the area. The red field is a symbol of patriotism as well as a link with our state flag. The design of the flag was conceived by one of our citizens using elements which existed in the logo for Cherokee Village. As we were incorporated in 1997, the flag was dedicated in 1999 and is now flown at City Hall, across the street, and in the governmental chamber of the city." Information and photos of the flag thanks to Councilman Russ Stokes. "Cherokee Village is a city in Fulton and Sharp counties in the U.S. state of Arkansas. The population was 4,648 at the 2000 census." - from Wikipedia: en.wikipedia.org/wiki/Cherokee_Village,_Arkansas.